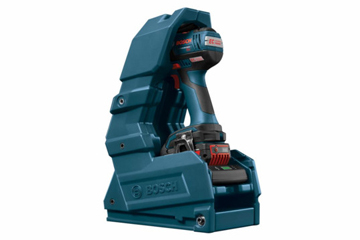 Bosch have unveiled the world’s first inductive charging system for cordless power tools. 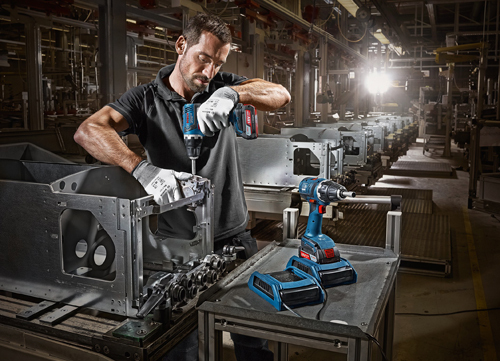 The Bosch Power Ready Wireless Charging is the world’s first inductive charging system for cordless power tools. Plug the charger in, and when you set a compatible 18V battery on top of it, the charger begins wirelessly transmitting an alternating magnetic field. A copper coil in the battery acts as a receiver, and the alternating magnetic field induces voltage, charging the cells until full. Between tasks, you can set the entire cordless drill, battery and all, on the charger pad to top off the charge. Greater user-friendliness and productivity because the batteries stay in the tool and can be parked on the charging station during every work interruption to charge them. Integrating charging into the workflow is very straightforward. The result is that the tools are always ready to be used. Complete flexibility because the inductive batteries within a voltage class continue to be compatible with all tools in that class. Very robust charging stations that no longer have contact points and are therefore durable against water, dust and dirt. We’re still awaiting an Australian release date for the Power Ready Wireless Charging System but will be sure to keep you updated.